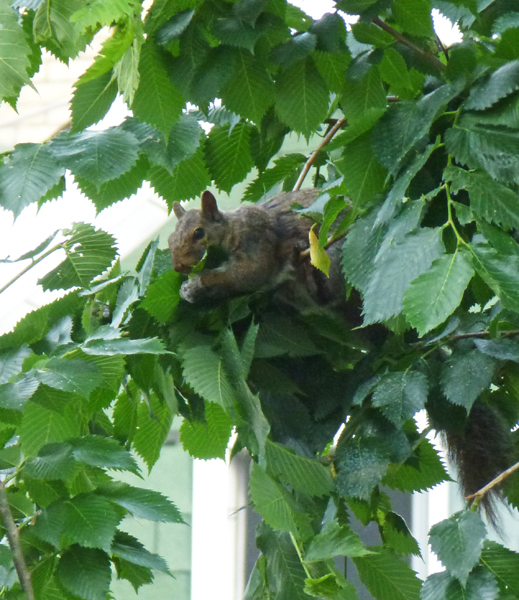 This grey squirrel was rustling around in the tree which overlooks my tomatoes and other plants and I think he was pretending that he wasn't interested in my things. He also seemed to think that I couldn't see him but the evidence he left of digging around the veggies would have given him away even if I hadn't heard him! ...my bird feeders have become squirrel feeders. He thinks you planted those things just for him. Hello, the squirrels always seem to find the found. I saw one climbing around in my blueberry bushes. Thanks so much for linking up and sharing your post. Happy Saturday, enjoy your weekend! PS, thanks for your visit and comment. This squirrel is pretending to be a bird, but I see you were not fooled. They are cleaver fellows even if they have a small brain. He's trying to hide! heehee! Hugs!